Architect, Philip Bodie, discusses the emerging King’s Lynn Innovation Centre and describes the vision behind the project. As with all Feilden+Mawson buildings, a thorough investigation of the 1.13 hectare site was carried out at the outset of the design process. 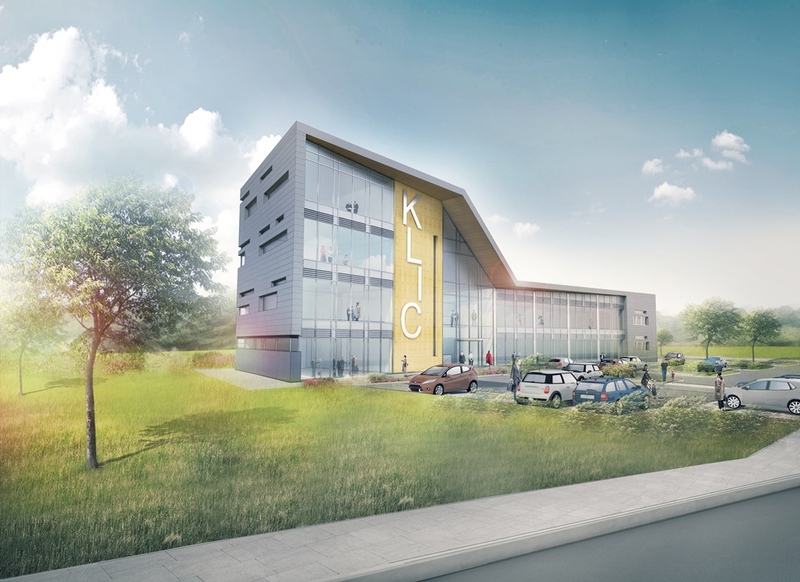 This allowed the designers to understand its opportunities and constraints which in turn helped inform the concept for the new King’s Lynn Innovation Centre (KLIC). The site falls within the Nar Ouse Regeneration Area (NORA) and has both the Nar Ouse Way and A47 running approximately east and west respectively to the south. The existing ground level is lower than the A47 with a north/south orientation and is bordered to the west by the river Nar. Feilden+Mawson is highly experienced in designing Innovation Centres and utilised its knowledge to establish a highly visible and striking concept that carefully responded to the various constraints, in essence providing a new ‘Gateway’. The building’s plan form is roughly rhomboidal as each side elevation responds to the adjacent site boundary geometry. The A47 was also instrumental to the design of KLIC as it not only provides a key view to the building, but is also a potential noise source, therefore the four storey conference block acts as a buffer protecting the rest of the Centre. The atrium and main entrance separate this element from the two storey office accommodation to the north. The sweeping roof then embraces all elements and returns down the southern elevation effectively tying the whole design together and reflecting road noise from the A47. The elevation to the east is fully glazed to give the feeling of vibrancy when viewed from the main car park and rest of the NORA employment zone: the west elevation is more opaque and acts as a ‘book-end’ to the site. The atrium is fully glazed both front and back to give a visual link to the river Nar and promote a sense of delight on arrival. Although the floor plan is roughly rectangular, the east elevation has been indented to provide additional roof cover at the entrance point and to reinforce the building’s point of access. The roof geometry has been designed to provide a single point of drainage and to obscure views to the roof plant at the northern end. Roof lights are situated over the office corridor to provide natural daylight to both floors by means of slots cut into the first floor circulation space. We believe that first impressions count not only to attract new tenants but to give a feeling of pride to those working within. The four storey atrium space is imposing, benefits from high levels of natural daylight and provides additional break-out and social space. External materials have been selected in response to the semi-marine environment, to provide clean lines and low maintenance. Overall, Feilden+Mawson has designed a sculptural form in the landscape that will be home to many new and established businesses for years to come.